Yesterday we covered room sprays, but what about perfumes and body mists? Using a body mist or perfume can help make a person smell nice when we go to events that we don’t want to smell like sweaty pigs, but we don’t want to smell like we have gone and jumped into a swimming pool of perfume either. What is the difference between a perfume and a body mist? A perfume is something applied in dabs. This is the small amount applied behind the ears and the wrists. Unfortunately our media advertising programs have worked against perfumes, and concentrated materials in general. We have been taught, through ads in all different mediums, that more is better. This is why perfumes have taken a lesser place in the market. Body sprays, mists and splashes are all applied generously. Think of the commercials you see which splash gallons, or it appears as such, of scented liquid across the body. If this were a real perfume, then the body would stink until 2030! We don’t want you to lose your family because they can’t stand your new odor, or have the neighbors complain. So, let’s consider the amounts of fragrance material used in each form of scenting liquids. Perfumes are 20 to 35% fragrance material. They are usually carried in alcohol, special denatured types so you won’t drink them to get drunk. Body sprays are often as little as 0.5% (this is half of 1%) and may go as high as 3%. Again, these are in special denatured alcohol. Scenting the body is as much art as it is science. A person should never wear so much perfume/body spray that others can’t stand being in the same room. This much scent destroys the ability to smell, and offends other people, all at the same time. 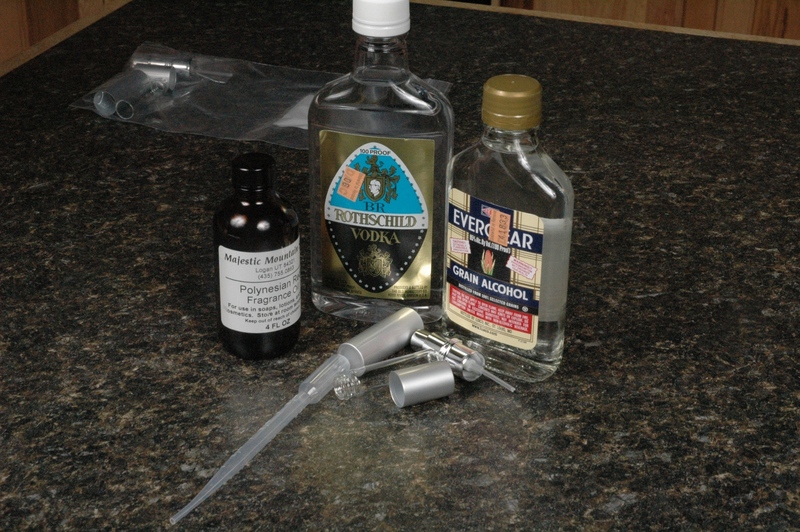 If you want to make small amounts of perfumes or body sprays in alcohol, for your self and family, then you can use Everclear from the liquor store. If you chose to sell the products, you must get a special denatured alcohol and the necessary permits for purchasing, and storing, such an item. To make with alcohol, let’s make something closer to a cologne or body spray. We will use the fine perfume atomizers for this project. Because this application uses a fair amount of material in the application (a full spray) we want to keep the amount of scenting oils low so the body isn’t overly scented. 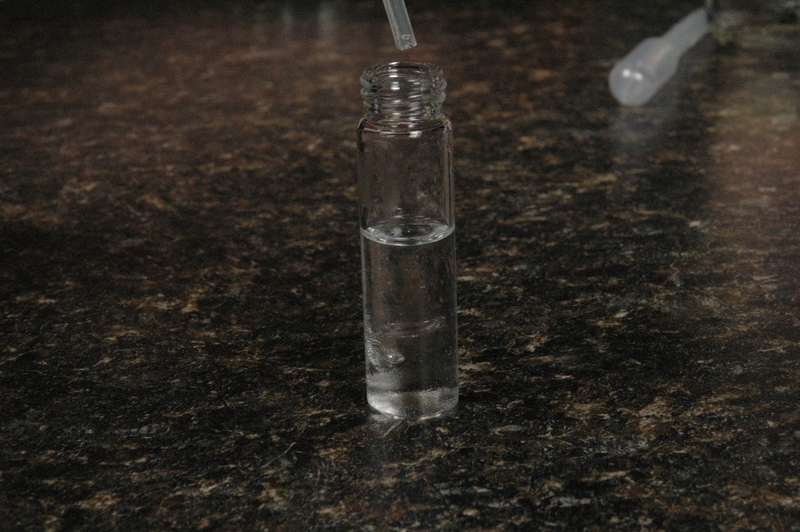 Measure 5 mL of alcohol into the atomizer bottle. Add 2% fragrance oil. (5 * 0.02 = 0.10) This is 0.10 mL of fragrance oil. 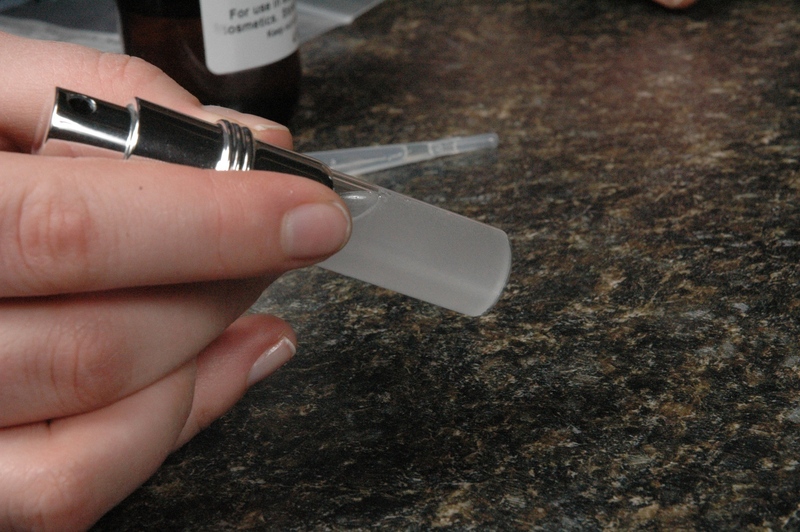 Fill a pipette with fragrance oil. Count how many drops are in 1 mL of scent. There will probably be about 20. Each scent is different, and each pipette can be different too. Once you know how many drops are in a mL, calculate how many drops are needed. If 20 drops are in a mL, then the math looks like this 20 * 0.10 = 2. This means of the 20 drops in a single mL, we only need 10% for our project. 20 drops multiplied by 10% is 2 drops. 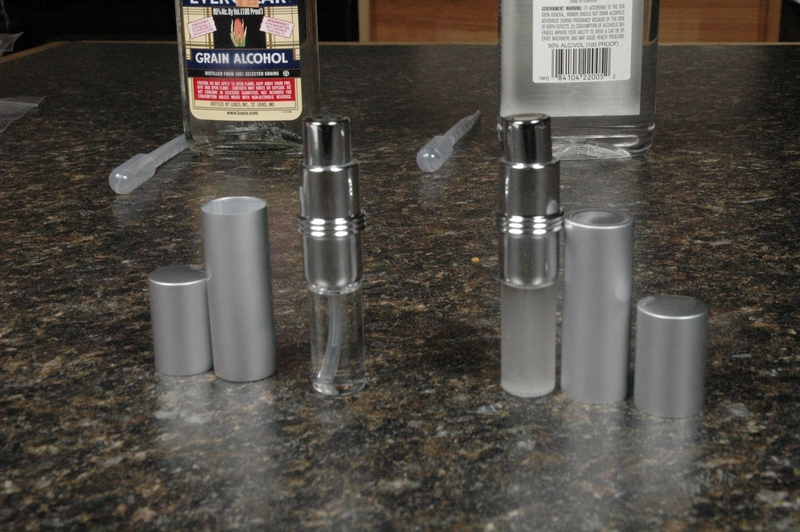 Add the scent, in drops, to the alcohol in the atomizer bottle. Cap the atomizer. Shake well. Label. The body spray is done. We have tested various scents, this one is lighter and fruitier, so we are using it at a higher usage rate. Something heavy like sandalwood or patchouly would be used at a lower rate. Shhh! Don’t tell anyone how easy this was. They won’t believe you, but just in case they did, our secret would be out! Before you ask why the Everclear based perfume is still clear and the vodka based perfume is cloudy, I will explain that. The vodka is 50% alcohol content in volume, or 100 proof. The Everclear is 95% alcohol content in volume, or 190 proof. What is proof? Proof is simply the percentage doubled, or the arbitrary standardized strength of the liquor. Alcohol is a solvent, so if you have a higher percentage of alcohol, the finished perfume will stay clear. This is why the Everclear which has 95% alcohol is clear, while the vodka which has 50% alcohol is cloudy. The vodka has more water in it, so the water and oil don’t mix! Next week is our Bath Tub Pleasure Week! Bath Fizzies for the kids and the kids at heart, bath oils for those leisurely evening baths, and bubble bath for bubbly entertainment! Wow! This is going to be so much fun! Adding fragrance oil to the vodka. 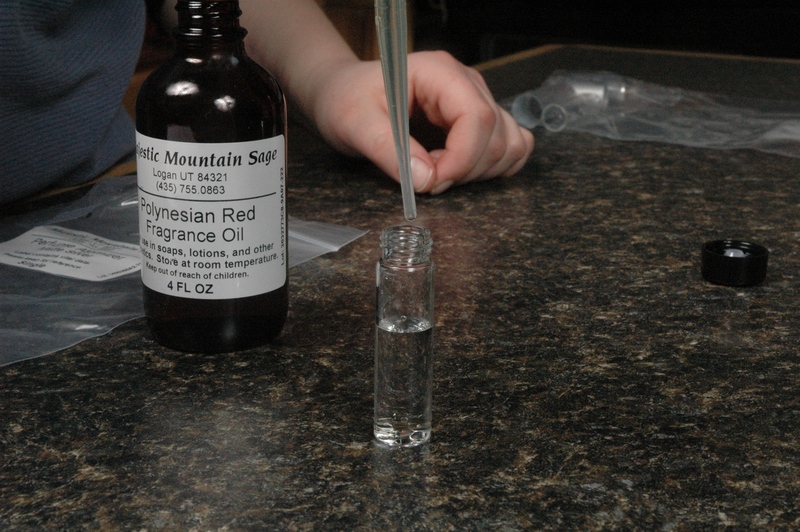 Adding fragrance oil to Everclear. Everclear perfume on the left and vodka perfume on the right. Perfumes are 20 to 35% fragrance material. They are usually carried in alcohol, special denatured types so you won’t drink them to get drunk. Well, I was wondering about Witch Hazel. I see many recipes online for using whitch hazel mixed with Distilled Water along with the FO or EO….is this a combination that will work as good as the denatured ? I did try this combination, I liked it, but I think the witch hazel does come thru just a bit. But I see you were stating if I used the denatured A, that I would need to get a permit to sell it. Witch Hazel would not be appropriate here. It is difficult to get the scent of just a perfume to come through. If you don’t want to use alcohol then use something that does not require the permits such as an oil. Remember too, perfumes are very concentrated and are not sprayed on. That is just too much scent being applied at one time. A dab is all that is needed for a real perfume. Lesser concentrations are also an option.